It seems hard to believe now, but asbestos was once considered a miracle material and was used in all sorts of applications within the construction and engineering industries because of its remarkable heat and fire retardant properties. Now, we know asbestos to be a killer but it took some time before employers adequately protected their staff from the dangers of asbestos exposure. Asbestosis is the asbestos related disease which first alerted the medical profession and the government authorities to the dangers of asbestos in the 1920's. In the factories where asbestos products were made, large numbers of workers were exposed to huge quantities of dust. It was found that many began to develop symptoms of chronic cough and breathlessness. As they continued to work and were persistently exposed to the dust, the symptoms became more acute. Workers also became more prone to developing tuberculosis and other infections. Many died. Microscopic examinations of the lungs at the post mortems of these workers revealed that the lungs had been penetrated by huge numbers of tiny fibres, invisible to the naked eye. The minute size of the fibres allows them to reach the smallest air sacs in the lungs. Once embedded in the tissue, the body's defence mechanisms react to the presence of the fibres causing scar tissue to form. In cases of asbestosis, which affects the lungs, this scarring first thickens and then breaks down the walls of the air sacs. This in turn reduces the efficiency of the lung in the transferral of oxygen into the blood. The flexibility of the lung to expand and contract is also compromised, making the breathing laboured. On discovering this, the presence of asbestos fibres in the lung led to the disease being named "asbestosis". Although the use of all types of asbestos in UK industry was banned in 1999, any house or property built before 2000 is considered at risk of having asbestos containing materials (ACMs) in its construction. Left undisturbed asbestos is not harmful, but if it is damaged and dust or fibres are released into the atmosphere, there should be cause for concern and the ACM should be disposed of under certified guidance. 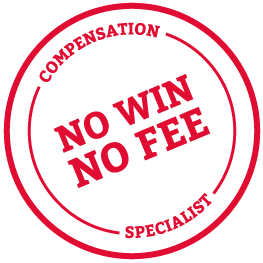 If you or a loved one has been exposed to asbestos you may have a claim for compensation call our specialist No Win No Fee Lawyers for FREE legal advice on 0800 0891331.